It is easy to make a misstep when filing a claim with the Georgia workers’ compensation system and lose out on the benefits you deserve. Many claims are initially delayed or denied because of avoidable mistakes. Listed below are some of the common mistakes that the workers’ compensation attorneys at Parsons & Associates have seen while assisting injured workers who have had difficulty obtaining benefits. Parsons & Associates, P.C., can assist you from start to finish in submitting a Georgia workers’ compensation claim. Contact us today in Atlanta or Savannah for a free consultation about our legal services. We do not charge a legal fee unless we obtain compensation for you. Not reporting a workplace injury. You must notify your employer in a timely manner that you have been injured on the job. Workers’ compensation is an insurance program employers are required to maintain for employees. 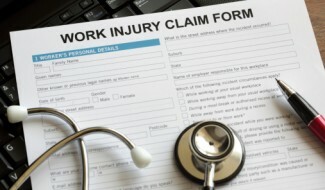 Your employer must know about your work-related injury or illness and any subsequent claim. Advise your supervisor and/or human resource (personnel) office in writing as soon as possible about how and when you were injured, what the injury entailed and that you are seeking workers’ compensation benefits. Keep a copy of this notice. Making mistakes on claim forms. You will be required to gather a lot of information and complete several forms to file a workers’ compensation claim. You must meet filing deadlines. Your claim may be denied if it is incomplete, or if it is not filed in a timely manner. Downplaying or overplaying your injury. Make sure every doctor you see about a workplace injury understands the full extent of your injury, but be truthful. Your workers’ compensation benefits will be based primarily on reports from the doctor assigned to your case. A doctor will see through exaggerations about your injuries, but he or she may not recognize problems you don’t explain. Providing false information during any phase of the process can jeopardize a workers’ compensation claim. Not following doctors’ orders. What the doctor assigned to your claim reports to the workers’ compensation board is very important. If your doctor tells the board you are not doing what is necessary to recover from your injury, your claim may be denied. In addition to taking medicine, you should be sure to keep all doctor’s appointments and follow the treatment as directed. Not getting a second opinion. In Georgia, workers’ compensation claimants must choose a doctor or a managed care group from a list of physicians approved by their employer. But an independent medical assessment may be helpful in some cases. Parsons & Associates can refer you to a doctor for a second opinion if you need that assistance. If a second doctor disagrees about the course of your recovery or treatment, we can help with an appeal to get the workers’ compensation board to approve the medical opinion more favorable to your claim. Returning to work too soon. Returning to work should be your goal, but returning too soon can hamper your full recovery. The problem is that your return to work saves your employer or their workers’ compensation insurer money as benefits end or decrease. Second, you are required to take work if you can do it. You may be urged to return to work before you are ready, even if you are offered limited or light duty. You should ask for a description of job duties and have your doctors determine whether you are ready for this kind of work. If you are not ready to go back to work, this is where a second doctor’s opinion may be helpful. Not returning to work. If the doctor of record on your claim says you are ready to return to work, you are expected to do so unless you successfully appeal this directive. Depending on your recovery, you might return to your old job or you may need to request reasonable accommodations for a partial disability. You may have to take a different job. If you are paid less because your disability requires you to take a different job, you may qualify for reduced-earnings benefits through workers’ compensation. You should return to work if your doctor says you are ready, and contact an attorney if you are paid less than you were before being injured. Missing a benefit if you cannot return to work. If you cannot perform your former job because of a catastrophic injury such as a severe head injury, amputation, severe paralysis or severe burns, you are entitled to receive limited vocational rehabilitation benefits to help you recover. Since vocational rehabilitation is an expense to your employer (through their insurance), the employer may not tell you about this benefit that is available to you. Unfortunately, worker’s compensation doesn’t provide vocational rehabilitation for workers classified with non-catastrophic injuries. Settling for the wrong disability rating. When the doctor decides that you have recovered as well as can be expected, he or she will assign you a permanent partial or total disability rating (assuming you do not fully recover). This rating is an important part of your final workers’ compensation settlement. If your disability rating is low, your benefit could be less than you deserve. Unless you have returned to work and are being paid as much as before being hurt, you should have an attorney review your case before accepting any disability rating and settling your claim. Not reopening a workers’ comp claim. In some cases, medical problems stemming from an occupational injury or illness occur long after the fact. Many people assume that because they have already accepted a workers’ comp settlement, they cannot seek assistance with these additional costs. This is an incorrect assumption. You may be able to petition the workers’ compensation board to reopen your claim if your doctor has advised you to undergo additional treatments for your original injury or disability, or there has been a significant change in your level of disability. The biggest mistake you can make after a workplace injury is to seek workers’ compensation benefits without the guidance of an experienced attorney. An insurance company seeking to deny your claim or pay out less than you deserve has a distinct advantage over you. Their attorneys understand the workers’ compensation system and you do not. Workers’ compensation attorney J. Michael Parsons of Parsons & Associates, P.C., understands Georgia workers’ compensation. He has dedicated his legal practice to ensuring that deserving workers get all of the benefits they are eligible to receive. Contact Parsons & Associates today. We’ll review your claim for free, and won’t charge for any legal services unless we obtain compensation for you.